Bracelet Length: 4.0" 4.5" 5.0" 5.5" 6.0" 6.5"
Divoti Anchor Link stainless steel medical alert replacement bracelet features stylish and unique design. This bracelet is sure to make your current medical id tag look more fashionable. It can match all Divoti interchangeable medical ID tags. Please note all Divoti medical ID tags come standards with our proprietary connectors which allows all lobster clasps can lay flat against the wrists. Our tags are extended by 0.5 inch because of our connectors. However, the chain will work with almost all other interchangeable tags as well. A durable PVC medical ID wallet card and medical alert smartphone apps are included. Medical Alert Apps are not only private, secure, user-friendly, allow you to update anytime, but also let you call for help with your current GPS location (by enabling and configuring it). We also offer a large selections of custom engraved medical ID tags. We offer free custom engraving and combo deals on our complete custom engraved medical alert bracelets. Please check them out on Amazon. 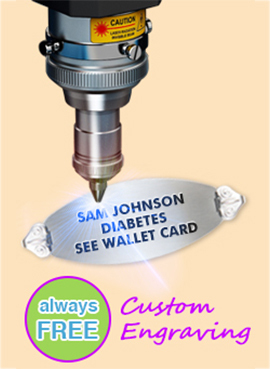 We personalize your medical ID in San Diego, CA. We personalize your medical ID in San Diego, CA. Custom engraving means ALMOST any medical IDs will work: Allergies / Diabetes / Blood Thinners / Gastric Bypass / Alzheimer's / Adrenal Insufficiency / Epilepsy, Seizure / Multiple Medications / No MRI / Chronic Conditions. INTERCHANGABLE CHAIN SIZE: This chain bracelet is measured from end to end in total length. Please measure the right size you need. 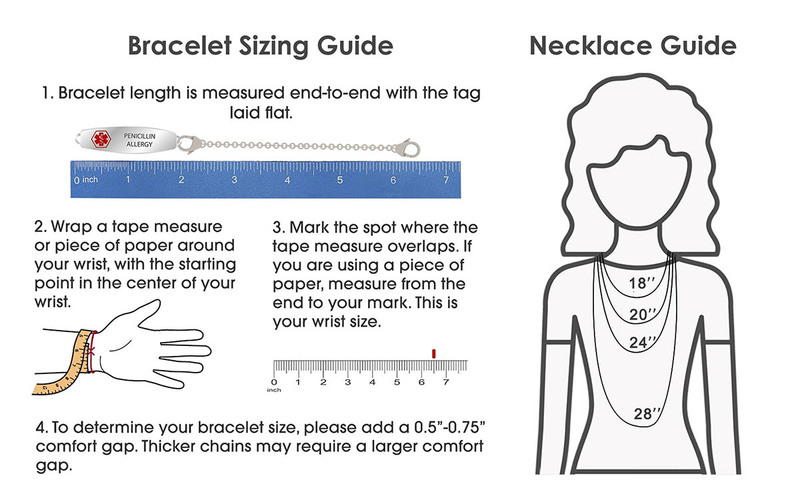 TOTAL BRACELET SIZE: the sum of length from interchangeable medical ID tag + interchangeable chain + your desired comfort gap. The comfort gap can vary from 0.25 to 1.0 imch based on your personal preference. CHAIN MATERIAL: High quality hypoallergenic surgical stainless steel. Excellent corrosion resistance and durability. FINISH & INTERCHANGEABILIY: Polished stainless steel chain with two 13-mm stainless steel lobster clasps. It can match all Divoti interchangeable medical id tags and almost all others.